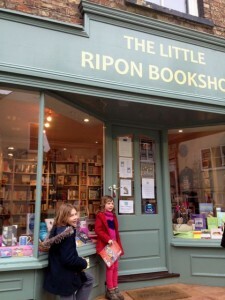 We had a wonderful morning in the lovely Little Ripon Bookshop in Ripon, North Yorkshire, on Saturday, March 2nd signing books and drinking tea. Gill even gave me my own rainbow signing mug! 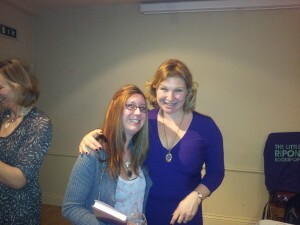 Old school friends, Yorkshire family, new twitter friends and Bookshop regulars all came along for a chat. 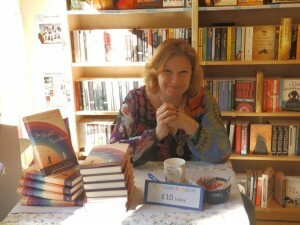 Since it was a beautiful sunny early spring morning we kept the door open and the book shop was buzzing. 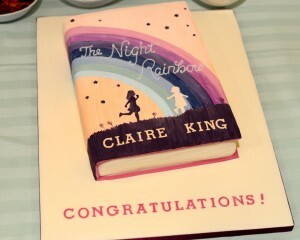 The window was dressed beautifully with rainbows and purple foil stars, and I even had a bowl of rainbow sweets on my signing table. 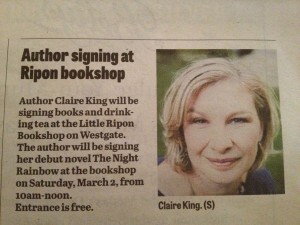 Everything had been thoughtfully organised, and even a mention in the local paper, so a huge thank you to the Little Ripon Bookshop. With ‘My Twitter friend Mike’ Jarman! My 5yo helping me sign. Over the rainbow signing mug! Later we cracked open the wine (thanks to my mum & dad-in-law!) at Thorpe Prebends House near Ripon cathedral, more chatting, more signing, my daughters forcing cheese straws upon everyone, and a gorgeous surprise Night Rainbow cake from my friend Vicki Murray. A huge thank-you to everyone who came along to support me, and to Gill, Simon and their children Phoebe, Alex and Harry from The Little Ripon Bookshop who all worked so hard to make the day special. There was a real sense of community around this day in Yorkshire. People, please support your local bookshop. Surprise cake, made me cry! See here for a write up from fellow writer/blogger V.L. Buckland. Here we are in her picture below.